Cherry Tree Pruning: When’s the Right Time? Expert insight into the best time to prune the different types of cherry tree; why cherry tree pruning is important, and how to identify common cherry tree diseases. Cherry belongs to the Prunus group of trees and there are various fruit bearing species across Europe including Prunus cerasifera (cherry plum), Prunus cerasus (sour cherry, also known as ‘Morello’ or ‘acid’ cherry), Prunus avium (sweet cherry), Prunus subhirtella (weeping cherry) and Prunus padus (bird cherry). All species tend to grow wide and tall, sometimes up to 10 metres in height, and benefit greatly from regular pruning. Why prune a cherry tree? 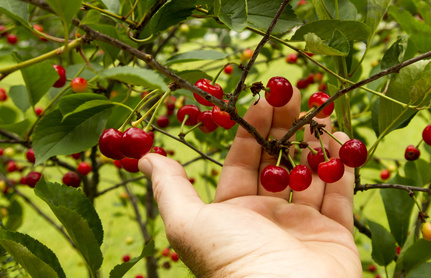 The key reason for pruning a cherry tree is to encourage a strong branch structure. 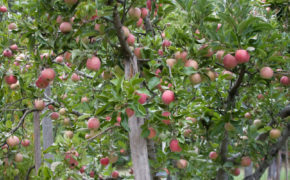 A large crop of fruit will weigh heavy, which makes it important to strengthen the branches in order to support a good harvest. Cherry tree pruning also allows more air and light to get to the fruit, which enhances its health and makes harvesting more straightforward as well as thwarting disease. You will also want to regularly remove dead or damaged branches for safety reasons, and these will usually be plentiful due to the pressure from the fruit crops. Diseased branches will also need to be removed and safely destroyed in order to ensure the health of the tree is maintained. The aim of cherry tree pruning is to promote an open and well balanced branch structure that is easy to manage and provides for plenty of airflow and sunlight penetration, and that looks good to the eye. Proper pruning at an early age will result in a good form that allows for excellent fruit yields and general good health overall. Cherry trees that have not been pruned correctly will usually suffer limb damage when fruit crops are heavy. In situations where a poorly maintained, mature cherry tree has been inherited, there will often be a risk of self-destruction due to large crops of fruit bearing too much of a load for under-cared-for trees and weak branches. In such cases, cherry tree renovation is what is needed to set off a new regime with the aim of reinstating strength and longevity. When is the best time to prune a cherry tree? The best advice generally as to when to prune a cherry tree is to do so during its dormant period, i.e. the winter months. Sweet cherry trees however are an exception to this rule as they are more susceptible to bacterial and fungal diseases such as silver leaf disease. The wounds created following pruning can make the tree more prone to picking up the disease because they allow the fungus to penetrate the wood, which results in a silvering of the leaves leading to the death of the branch. Therefore you must keep your pruning of sweet cherry trees confined to the early to mid-summer months. This is also the case with the weeping cherry, which again is prone to silver leaf disease. Bear in mind though that summer pruning results in a reduction of the tree’s energy for fruit production, so keep the pruning to a minimum. You are best to stick to simple thinning, i.e. the removal of a limb or branch up to the point of where it grew from. This will also help to open up the tree’s canopy, so letting in more light and improving airflow. Summer pruning results in a reduction of the tree’s energy for fruit production, so keep the pruning to a minimum. Pruning a cherry tree other than sweet cherry or weeping cherry during its dormant period will not affect the energy reserves. Providing you take care to do your pruning as late in winter as possible, you will avoid damaging the tree. Young cherry trees, i.e. those under three years of age, benefit from early spring pruning. Training and shaping the tree before it comes into blossom is ideal, starting as the buds start to come out but waiting until there is no chance of frost or extreme cold because younger trees can suffer from cold injury. Mature cherry trees can be pruned after they bear fruit, or in early spring. Never proceed with any tree work without first checking whether there is a Tree Preservation Order (TPO) in place. If there is, then permission must be obtained for the works and this can take up to eight weeks to come through. Furthermore, if the tree is located in a conservation area, permission will be needed for any works. Without a good understanding of tree biology, it can be easy to damage a tree, sometimes fatally, when carrying out pruning. Cherry tree pruning can be quite a complex undertaking and much more involved and detailed than we have expressed in this general guide. There are numerous common problems that can come to light when pruning a cherry tree, and if you are not in a position to identify them and know what to do to rectify them, you could risk seriously damaging the tree. Furthermore, there are many different types of cherry tree which call for very different methods and timings of pruning; so before you embark on your pruning regime, you must be quite clear on which you are dealing with. 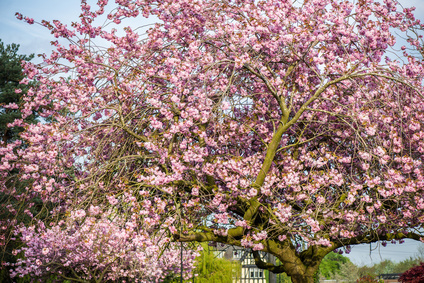 If your aim is to produce a beautiful cherry tree that you can be proud of; one that produces excellent crops of tasty, healthy fruits, then you really should seek expert assistance from a qualified tree surgeon when it comes to pruning it. 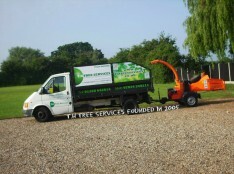 If you have a cherry tree on your land that needs pruning, why not contact T.H. Tree Services? As fully qualified and extensively experienced tree surgeons, we can offer specialist knowledge and skill in all aspects of cherry tree pruning. For a free, no-obligation quotation, give us a call on 01268 642814 or get in touch here.